Babies are the biggest asset for every women. Getting pregnant after marriage is such an overwhelming for almost all women who are wishing for a parenting role, that too getting conceive with twin babies are like flying in the heaven. Giving birth to a child is indeed what every woman craves for and this feeling is unmatched with any other pleasures of life. Conceiving with twins under natural circumstances are unpredictable one but while undergoing any medical treatments such as IVF, IUI there are a lot more chances to get conceive with twins medically. 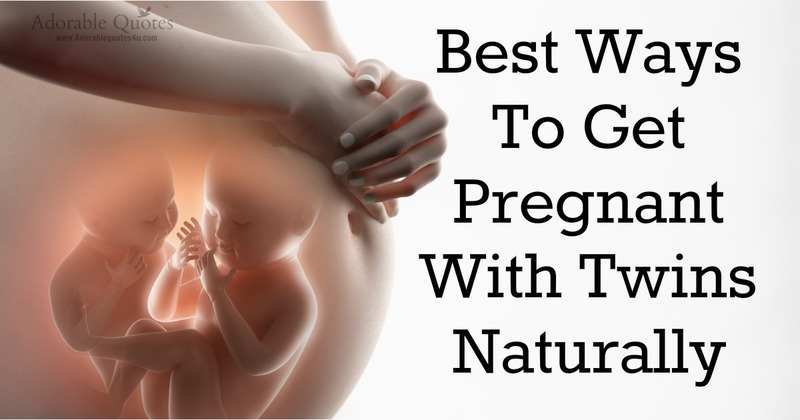 But if you are curious to know if there is any natural ways to increase the chances of having twins, then read on further.. Most twins are fraternal. Fraternal twins are conceived when two eggs are released during ovulation i.e. they develop from two separate eggs. Whereas, Identical twins are rare and happen as a result of just one egg which splits in two in early pregnancy. How to increase the chance of getting conceived with twins. There are certain things that will increase your chances of having twins, but some of other things are really out of your control. For example having a family history of twins will increase your chances of having twins. Other factors that may affect your chances of having twins are your ethnicity and your age. African American women are more likely to conceive twins than Caucasian women. And, Asian women have a lower chance of conceiving twins. Twins are also more common in older women. Here I am posting certain things that improve the chances of having twins. As I said earlier some factors to be happen naturally and some other factors are in our control that will increase the chances of having twins. According to a recent study women with a BMI (Body Mass Index) of 30 or higher have more chances to have twins. • Women who are older are more likely to have twins. However, the risks also increase; older mothers have a higher rate of miscarriage. • Increase the intake of dietary products: Women with adequate intake of dairy products increase their chances of having twins by 5 times.Eat wild yams. The theory comes from Africa. A small town in Nigeria claims to have the highest rate of twins in the world. There may be a chemical in wild yams, or cassava root, which may cause hyper stimulation of the ovaries, resulting in the release of more than one egg during ovulation. • Continue breastfeeding. According to one twins study, women who were breastfeeding when they conceived were nine times more likely to conceive twins than women who are were not breastfeeding. If you like this blog don't forget to share it.